The Hyundai Elantra nameplate has been on the scene for 25 years. Now in its sixth generation, the stylish small sedan is aimed squarely at the likes of Toyota’s Corolla Sedan and the four-door Mazda3. An all-new chassis, new engine and ‘Fluidic Sculpture 2.0 design’ reflects the brand’s growing confidence as it shifts from a value proposition to what Hyundai itself terms ‘modern premium’. As such, the base Active’s price has increased… but the Elite is actually down on its predecessor. The Elantra starts at $21,490 (plus on-road costs). The twisting road ahead appears an odd place to launch a small, value-leading sedan. Avid Targa Tasmania followers – or fans of touring Tasmania’s wonderful north-east – would know The Sideling Pass, a sinuous ribbon of sometimes-bumpy, sometimes-cambered tarmac that starts beyond Launceston and spits you out towards Scottsdale. I’m in the passenger seat of a new Elantra Active. Priced from $21,490 (plus ORCs) in six-speed manual form (and not available on-launch), this particular vehicle is fitted with the optional six-speed automatic, taking the price to $23,790. These prices reflect the cost of non-metallic Elantras, so it’s a case of white only at this price… or pay another $495 for a metallic paint option. My earlier drive on smooth roads (if you discount the roadkill) and highway conditions revealed a smooth-shifting automatic, improved NVH (via a key focus on aerodynamics that realises a 0.27Cd, though there’s still tyre roar coming through) and a slight delay to initial steering inputs before the car settled on its 16-inch alloys. Still, I am ruing my decision to take the earlier drive leg as it’s my now-chauffer that examines the Elantra’s stiffer chassis and locally-tuned suspension on one of the best roads in Australia. As a passenger, it immediately impresses with a cosseting ride that’s well-matched to the comfortable cloth seats, but also offers decent wheel control, only consecutive large bumps denting the Elantra’s composure. Without the driving distraction, this section allows me to settle in to debate if Apple CarPlay is really the future of in-car infotainment. Given that Hyundai has suggested that the Elantra customer is likely to be on the older side, it is surprising to see there’s no option of internal navigation capability. Of course, it saves a build cost for Hyundai, but it could be a turn-off for those who are less tech-savvy, or those not wanting to engage their phone data plan in transit. Move beyond that and the CarPlay connectivity works well, with a familiar interface for iPhone users and SIRI voice capability. Android Auto users should also note that they will be catered to later in 2016. 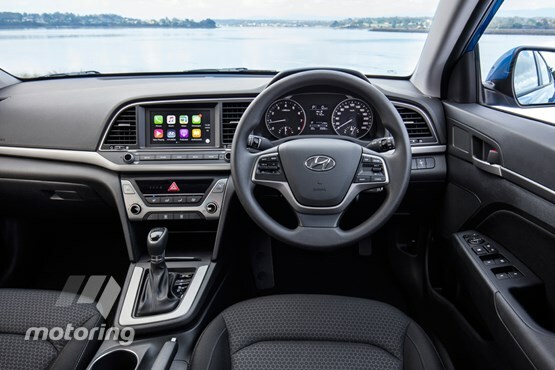 The Elantra’s centre stack is also cleanly laid out, with controls logically grouped together in function beneath a 7.0-inch TFT screen that also functions as a reversing camera. 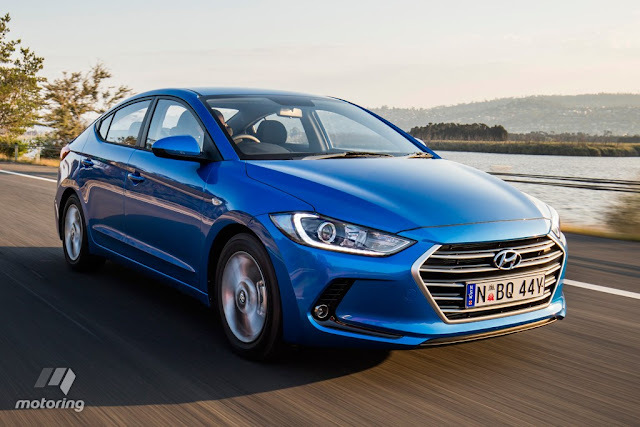 Recent Hyundai experience suggests, however, that the Elantra is a bit light-on in terms of standard specification, especially in Active trim with its old-fashioned keyed ignition and a driver’s window that requires the switch to be held to bring it up. The brand also says some of its active safety tech, such as lane-departure warning and active cruise control that is available in left-hand drive markets will soon be available here, possibly debuting on the upcoming SR Turbo variant. There’s still a torsion beam rear in the new Elantra, but the dampers have been placed vertically, rather than inclined. This gives more direct control over wheel movement, at the expense of boot space. At the front, a focus on NVH suppression led to new suspension geometry and bushings, though as we’ve noted tyre roar is still prevalent. Interestingly, the local engineering team had to arrive at a suspension setting that would work with both the 16-inch alloy and 205/55-series tyre package of the Active and the 17-inch alloy and 225/45-series combo of the Elite. Some 48 combinations of spring, damper, bushes and bars was locally trialled before the spec was settled that maximised ride comfort ‘first and foremost’. Before The Sideling, there are a couple of surprises. On similar roads on which I drove the Active, the Elite’s steering feels more responsive on the lower-profile, wider tyre but it comes at the expense of finer control, with a little extra ‘float’ over those large, multiple bumps. The second surprise is a gravel section. Is this a link to Hyundai’s ever-increasing rallying involvement, or a further chance to showcase a class-leading ride? Whatever the answer, the Elantra remains composed over at-speed corrugations and still responds keenly to steering inputs. On a couple of occasions the progressively-weighted brake pedal needs a decent shove, revealing relatively tight stability control and anti-lock braking parameters. Through the initial uphill section a lack of torque is revealed; where the downsized turbos within this price bracket (though not found in Mazda and Toyota offerings) could use third gear, the Elantra works better revving higher in second gear, accessed via the sequential shifter mode. The manual may well prove the transmission pick, after all. Thankfully, the enlarged 112kW/192Nm 2.0-litre revs more cleanly than the 1.8-litre unit it replaces and sounds less strained in doing so; but it is perhaps the weakest link. Claimed fuel consumption is 7.1L/100km, though we saw 7.6L/100km on test. The increased grip offered by the 20mm-wider tyres means traction is no issue out of the tighter stuff and the steering response remains keen, loading up nicely as the body rolls onto the outside-front. Only on really bumpy sections does the compromise to ride comfort over ultimate control really reveal itself. While we’d wager that the majority of naturally-aspirated Elantra buyers won’t notice such things, they will notice Hyundai’s market-leading iCare program. There’s a lifetime capped-price service plan on offer, a five-year / unlimited-kilometre warranty, complimentary roadside assistance for the first year, a 10 year roadside support plan, a free 1500km initial service and a dedicated customer care center. Making the Elantra a better steer was an obvious priority. This has been achieved, and we can’t wait for the SR Turbo variant to arrive as a result. For now, it’s tough to argue against Elantra setting a class benchmark for ride. More practically, rear-seat head room remains an issue and the reduced boot space might mark it down for some; others will question the move away from factory-installed sat nav. The Elantra’s trims may not match something like a Mazda3 for quality, but it is well put together and is confidently styled. Judging from this initial impression the Hyundai Elantra has finally lifted itself into the established Corolla/Mazda3 ballpark with this sixth generation.